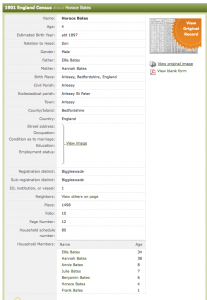 Horace was born in Arlesey in 1897. 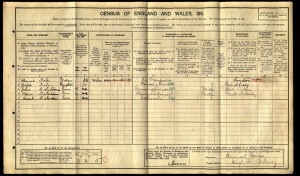 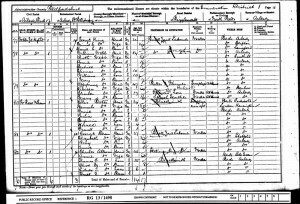 Horace had a mother called Hannah, who was aged 54 at the time of the 1911 census. 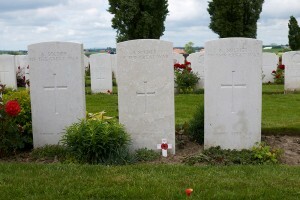 He also had a 17 year old sister called Julia and 2 brothers called John (16) and Jacob (?) 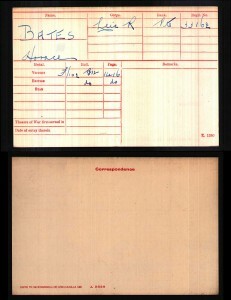 (11). 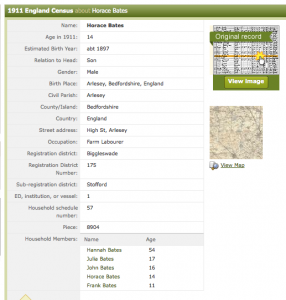 Horace also had another sister called Annie Bates, but she was not living in the village at the time of the census. 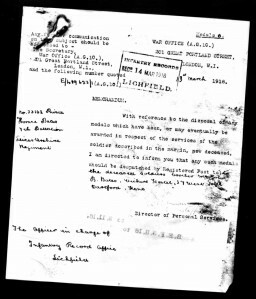 She was located in Upper Norwood. 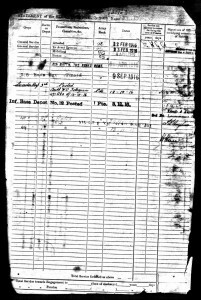 John and Horace were both working as farm labourers before Horace enlisted in the Army at the age of 18. 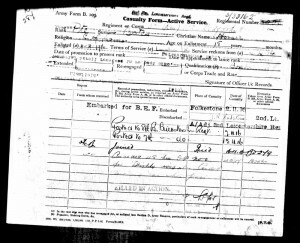 He enlisted on the 4th April 1916. 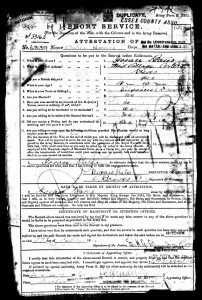 His records say that he was only 5 foot 2 ¾ inches (which is quite short). 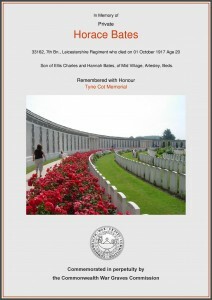 He was posted on the 7th April 1916 in the 8th Battalion of the Leicestershire regiment. 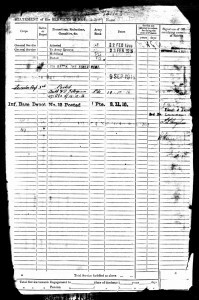 Later in the year, on the 13th November he was posted to the 7th Battalion. 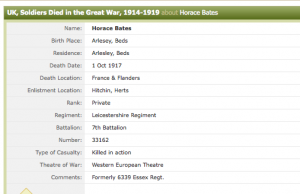 Horace Bates died on 1st October 1917 in Belgium, one year and 6 months after he enlisted. 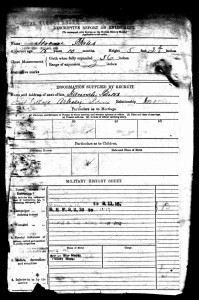 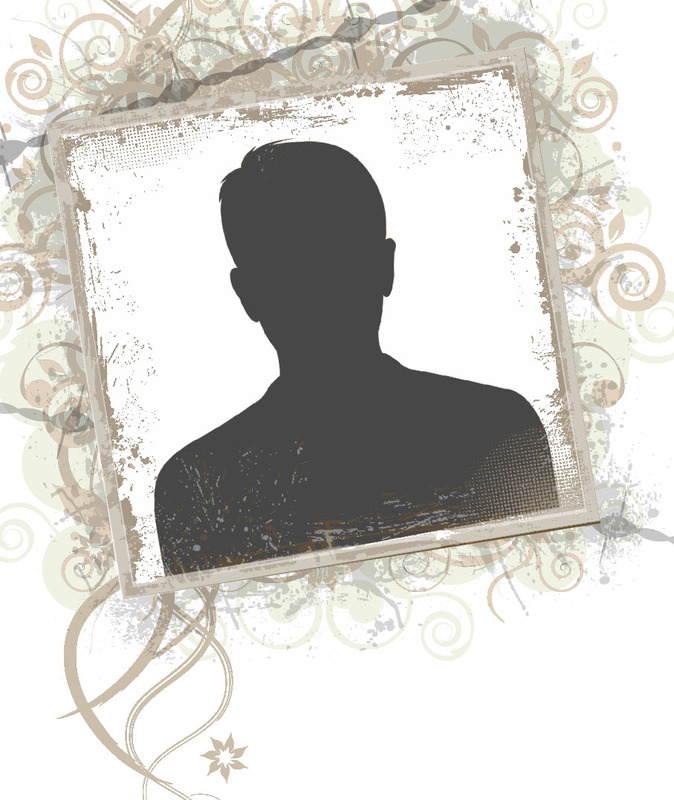 He was son to Ellis Charles and Hannah Bates of mid-village Arlesey. 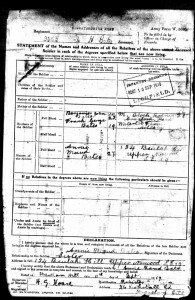 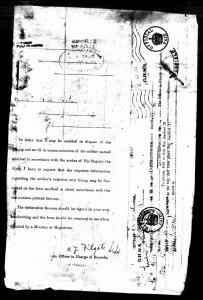 However it was his sister Annie Maud Bates that was sent his possessions on 2nd March 1918 and his memorial scroll on the 3rd October 1920, 3 years later. 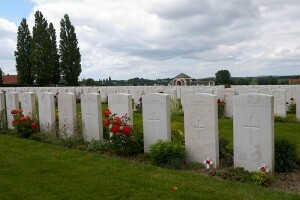 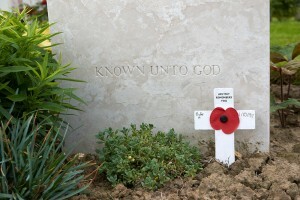 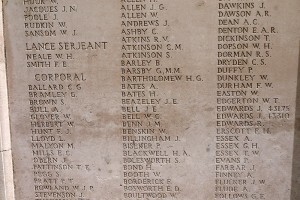 His name now appears on the memorial in Arlesey and on a memorial stone at West Vlaanderen in Belgium. 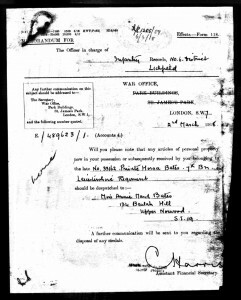 Horace was awarded the victory medal for his service.